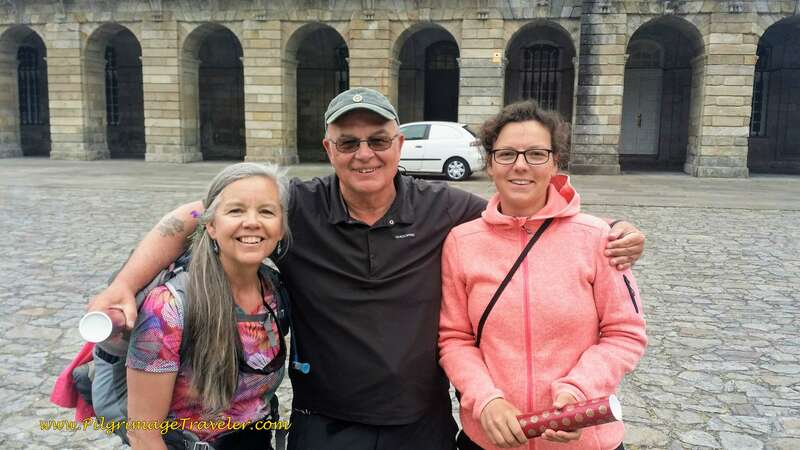 Our day twenty-five on the Camino Portugués, drawing to a close, was an emotion-packed day, walking the final nine kilometers and reuniting with friends in Santiago de Compostela. Our journey was ending, but our pilgrimage had only just begun. Our final map of the day, short and sweet as we walked the final nine kilometers into Santiago, without stops or breaks. We chose the longer, scenic route via Conxo, as you will see farther on in the text. I marked the accommodations where I have stayed in my trips to Santiago. I would recommend them all. There are many, many more to suit your budget and style! It may be wise to book ahead, if you are arriving on the weekend or in high season. Do so by clicking here. 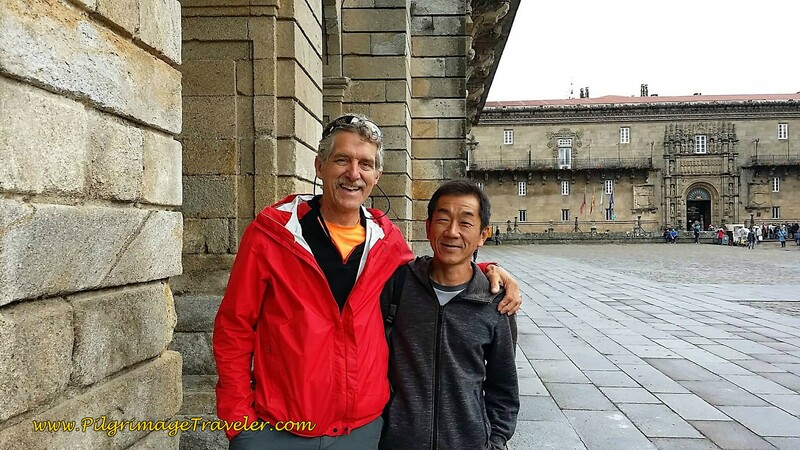 Milladoiro is essentially on the same elevation level as Santiago, however, the drop down to the river Sar makes the climb back up to Santiago surprisingly strenuous! Especially when we thought it was a smooth sailing day. The elevation change is only about 100 meters (300 feet), but even on the last day, or maybe because of it, I felt it. 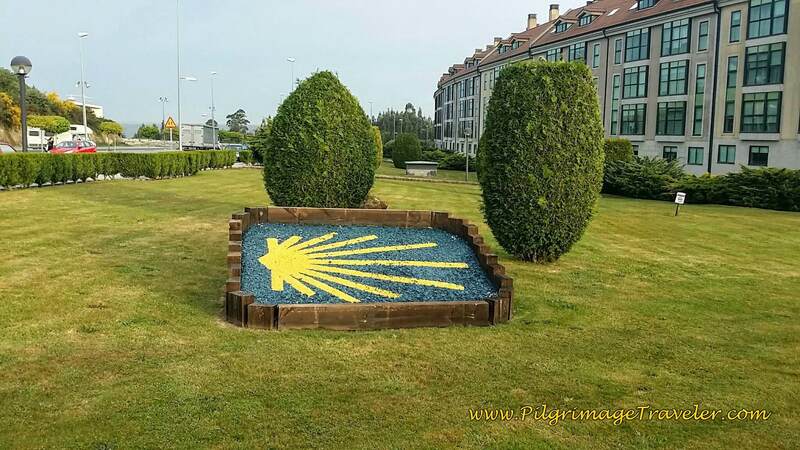 After leaving the Albergue Milladoiro, we walked north on the Travesía do Porto about 210 meters, passing by this lovely garden waymark. 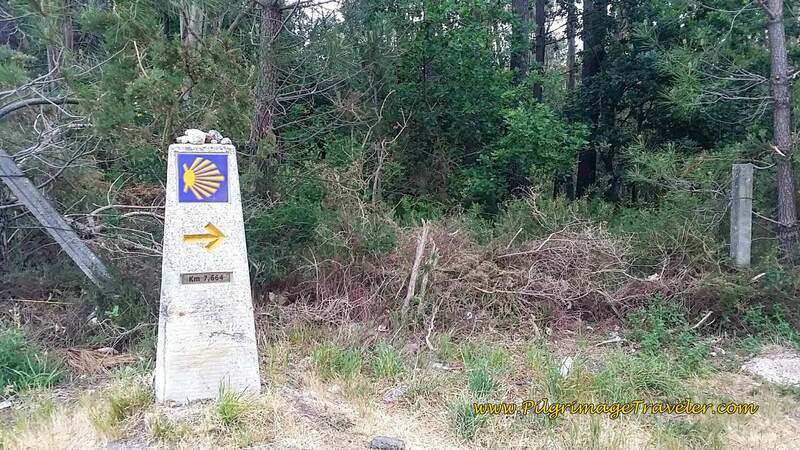 The waymark says 7.6 km, but didn't we pass the 6 km waymark a ways back on day twenty-four?? Hmm, interesting. Plus my GPS measured 8.95 km for this part, so take all these kilometer markers with a grain of salt! Even if I subtract out a whole kilometer for taking the longer route, it doesn't quite all add up. I was feeling very emotional on our final day. It was exactly 4 weeks since we started walking. Rich felt like it went by really fast, I felt like it didn't. I tried to identify my emotions, but it was difficult. It was relief, sadness, joy, exhaustion, all rolled up into one big ball, most likely! Whatever the case, I felt totally out of sorts. ...and becomes the Rúa da Rapada. 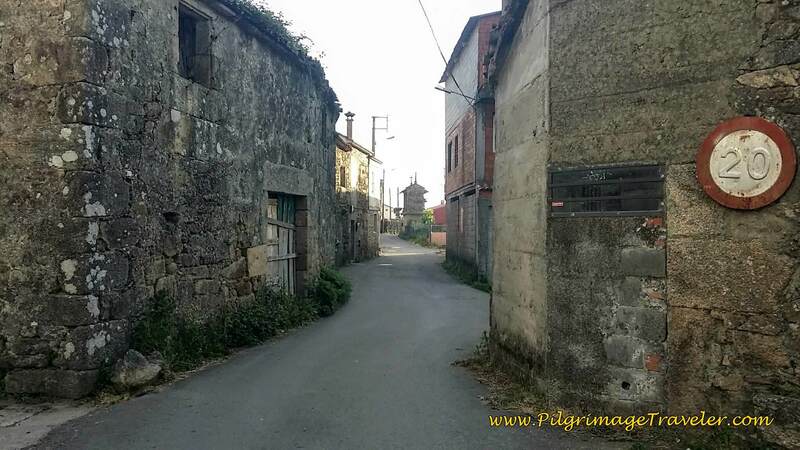 In not quite 1/2 km from leaving the path, we walked into the village of O Porto de Conxo. We walked past several lovely, old hórreos (granaries). Continue through town, bending to the right at the north end, onto the Rúa das Covas do Porto. It was along this street that the views of Santiago first came into focus and we could actually see the Cathedral towers! 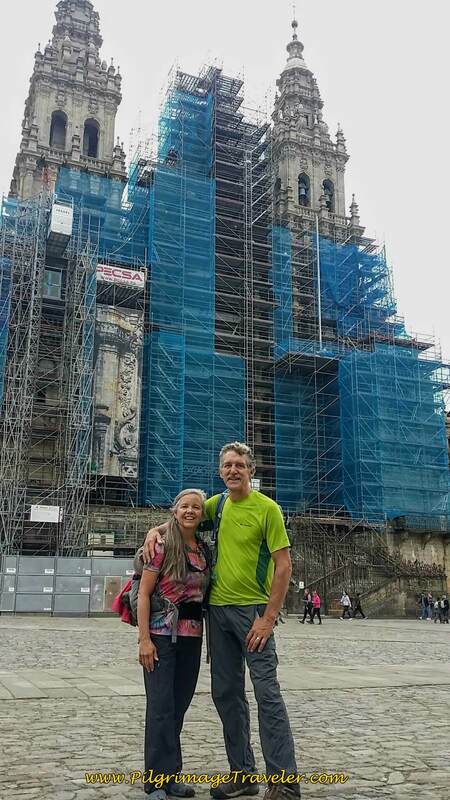 Though difficult to tell in this photo, we were sure it was the Cathedral of Santiago de Compostela. You can see in this photo how you must walk down, then climb back onto the hill that is Santiago. I was shooting into the sun, so the photo is not very good. We Spy the Cathedral of Santiago de Compostela Ahead! From town you continue to walk down the hill. In about 1/3 km come to a T-intersection, bend to the right and continue downhill, paralleling a highway ramp. At the bottom of the hill, turn left and walk under two highway ramps. As we walked along, we actually held hands for a large portion of the day twenty-five. 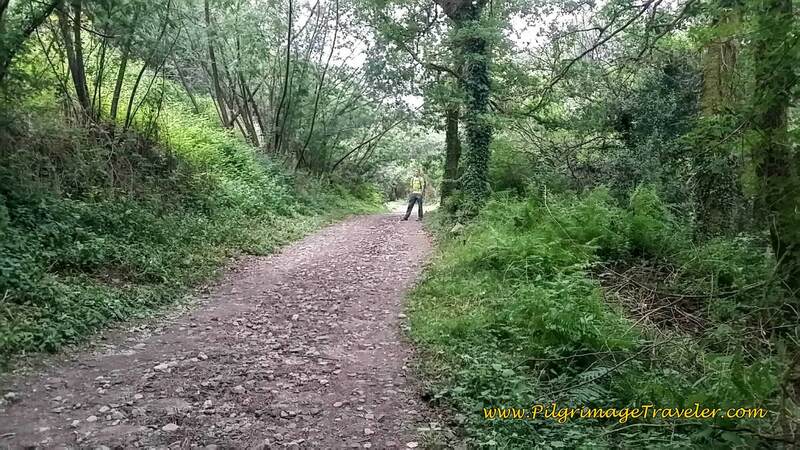 It was touching for both of us, doing this Camino Portugués together ~ a reprieve from elder care, and not knowing what lie ahead for us. 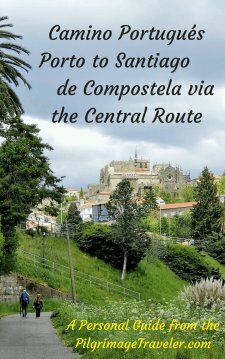 All we knew was that like the Camino, we were going to take this journey together. 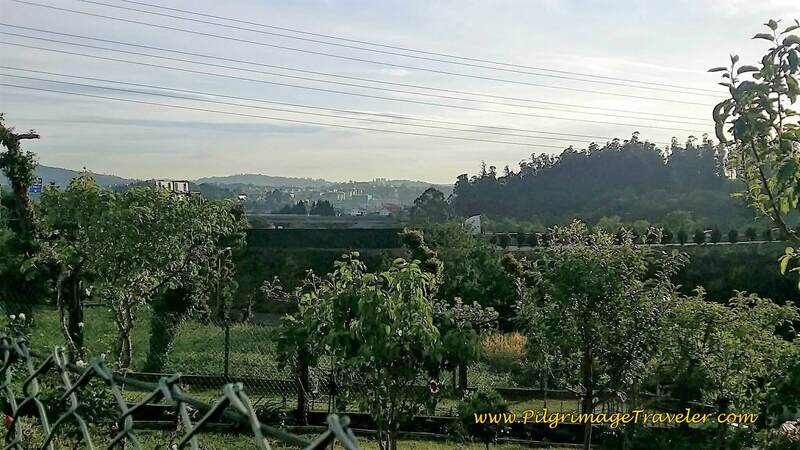 We continued on, following the Vilar River valley, staying right at a Y and could see the next interchange ramp ahead, that we would walk under! Welcome to the large city of Santiago! As you approach the second overpass system, stay left again, two times, and walk under the bridge, taking the left turn onto the Rúa do Beado after about another 1/2 kilometer. Following the highway, now to the north, climb back up out of the valley. 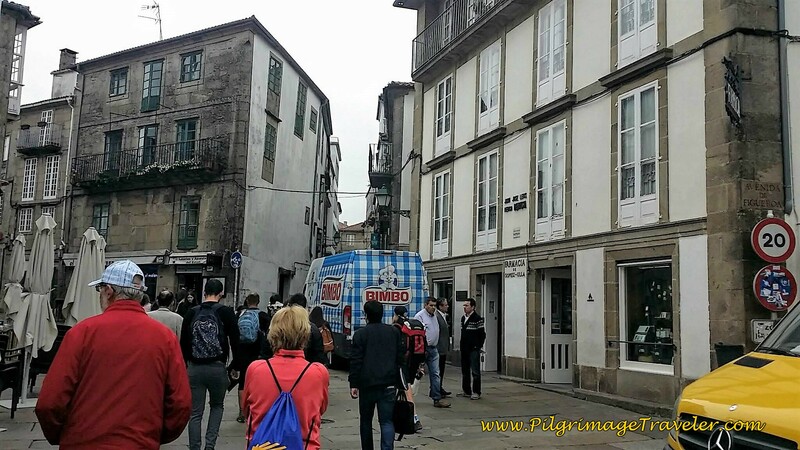 This was not-so-lovely an area to walk through, yet I was amazed at how the planners kept the pilgrimage traveler off of truly busy highways, all the way into the city on day twenty-five of the Camino Portugués. 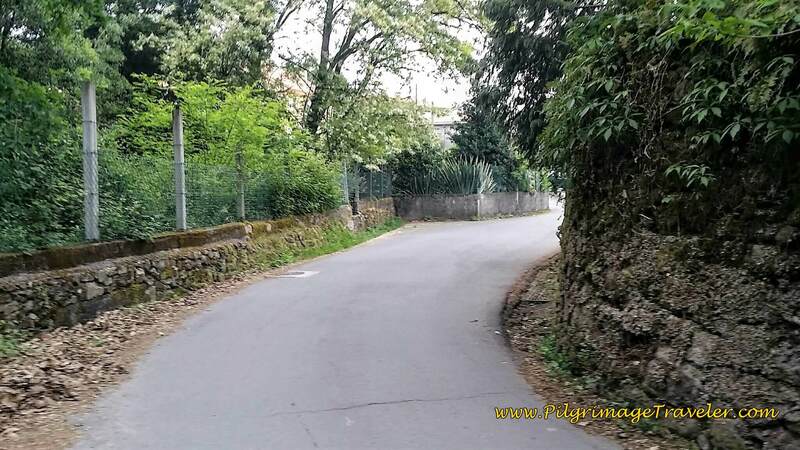 Walk 0.7 kilometers to the roundabout in the next town of A Rocha Vella on the Rúa do Beado, a lovely, rural road. Stay right at the Y intersection in town by a fountain, and bend to the left, up the hill and to the roundabout at the center of town. Pass the 5.5 kilometer marker. 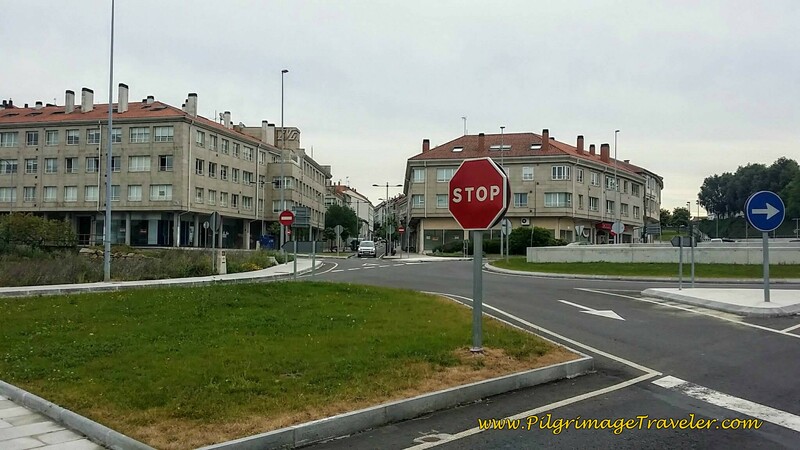 Stay right at the roundabout and onto the Rúa Serafin Zas on day twenty-five of the Portuguese way. Continue on through town. 380 meters onward turn right on the Rocha Nova, cross over the railroad track, bend around it to follow the tracks down the hill, 400 meters later. Bend to the right and continue on the narrow paved road to walk into another forested area. 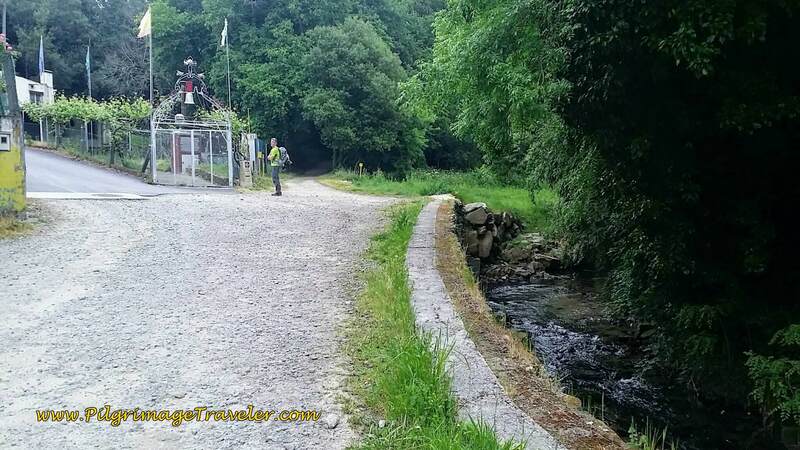 In 130 meters, bend to the right at a T-intersection, then walk an additional 300 meters following the Sar River, crossing it and coming to this place where you pick up another trail system. This lovely 1/2 kilometer section of trail is a welcome respite before entering Santiago proper. The trail continues to follow the Sar. Walk under the highway (SC-20) and come out on the other side by this estate's wonderful gardens. 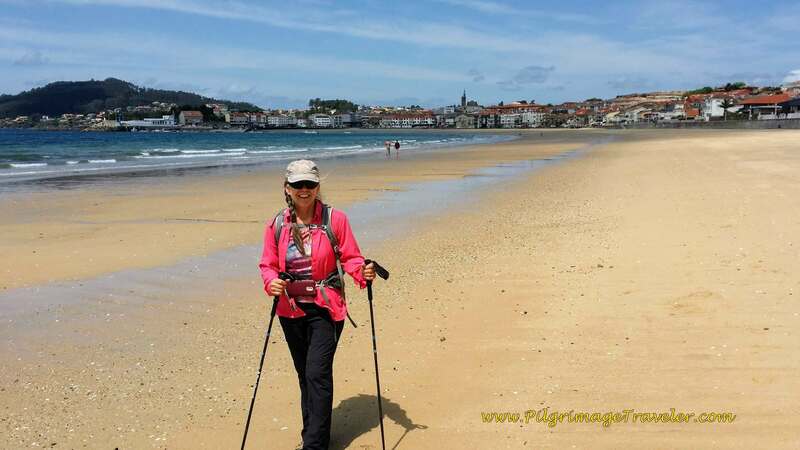 Your downhill and flat walk on the Camino Portugués for day twenty-five has just ended here! When the path bends to the left, pick up a paved lane, the Rúa da Escurridia, that follows the highway you just crossed under. In 140 meters, turn right, picking up a 2-lane street for a few meters, then turn left onto another narrow paved road. In a short 170 meters, come to this point where a decision needs to be made. 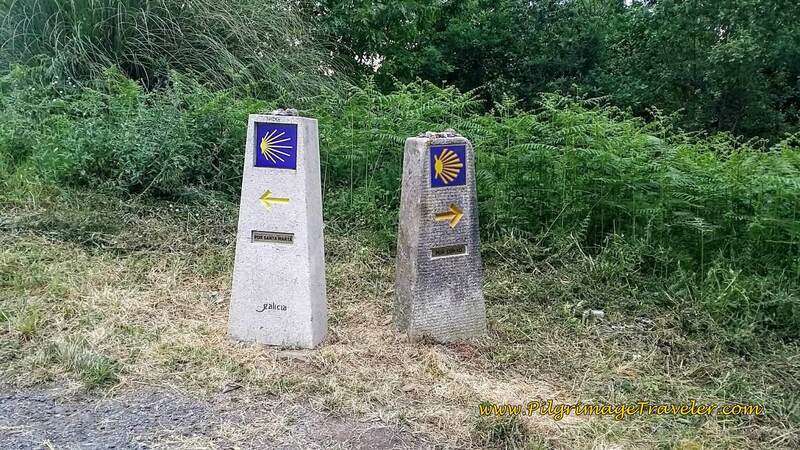 One waymark says "Por Santa Marta," the other "Por Conxo." We chose the way to the right, towards Conxo. We picked the more rural-looking one down the hill! 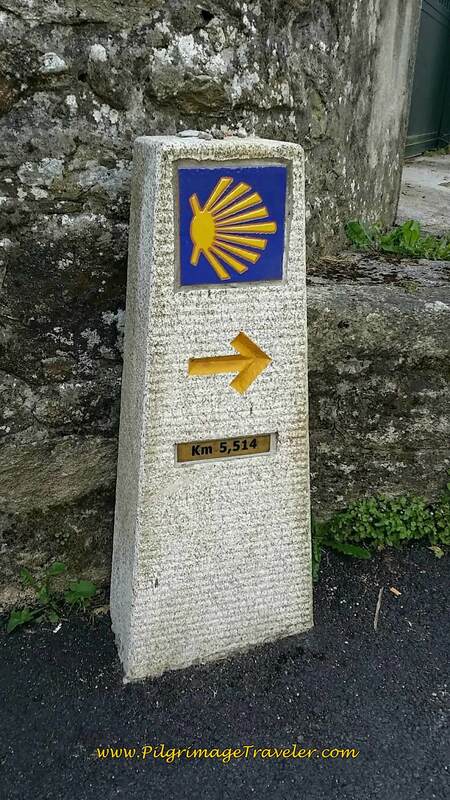 I think this choice, while more beautiful, perhaps added another 0.6 kilometer or so to our day twenty-five on the Camino Portugués. If you chose the Santa Marta route, it walks you up and over the highway, the SC-20 and immediately you are walking into an urban area. Essentially this route is a very long straight shot down the Rúa da Choupana and the Rúa de Santa Marta de Arriba to join the Conxo route in 1.7 kilometers at the Plaza de Vigo, see description farther below. Choose the more direct, urban route via Santa Marta, or the longer scenic route through Conxo. Walk the open stretch to the next cluster of houses in the outskirts of Conxo in only 300 meters. 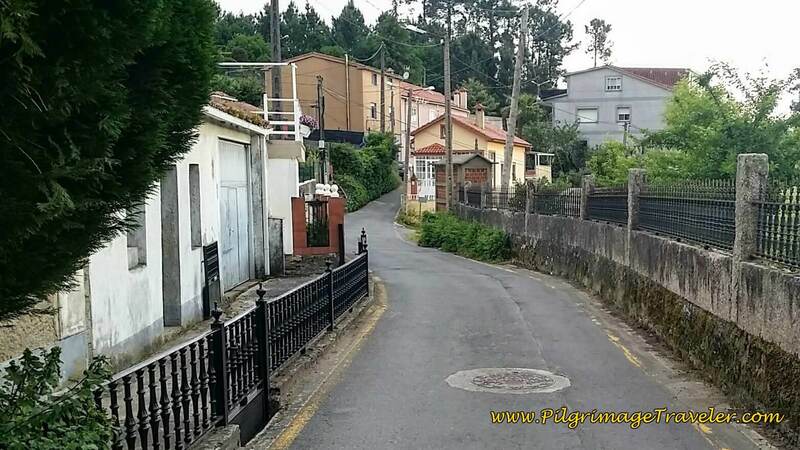 Wind around the houses, turn left onto the Rúa da Benéfica de Conxo, and walk not quite another kilometer through increasingly urban terrain. This is a now a broad highway with a nice sidewalk to walk upon. The road bends to the north and immediately the 17th century monastery and church greets you. 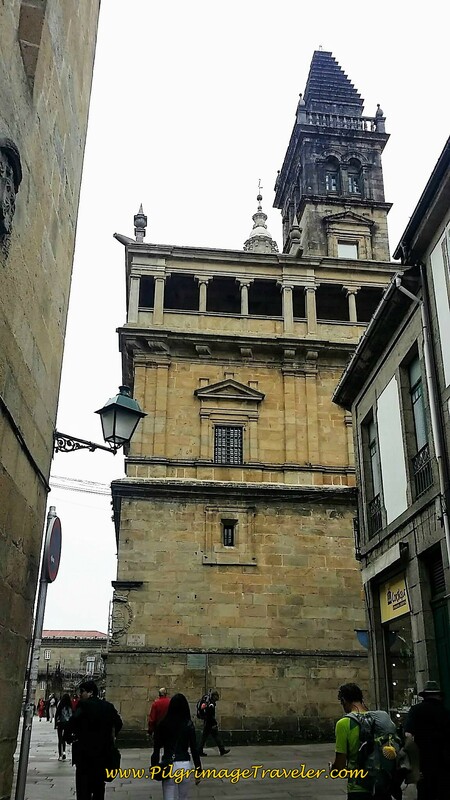 This is the Nuestra Señora De La Merced De Conxo, a landmark for your day twenty-five on the Portuguese Way. Walking onward a few meters, come to a large roundabout and the highway you've been following to the south, the SC-20. Carefully cross the highway on crosswalks and take the 2nd left onto the Rúa de Sánchez Freire, a narrow and much friendlier street. Here the sidewalk is wider than the one-way street! Just past the roundabout we spotted the 2.25 km marker! 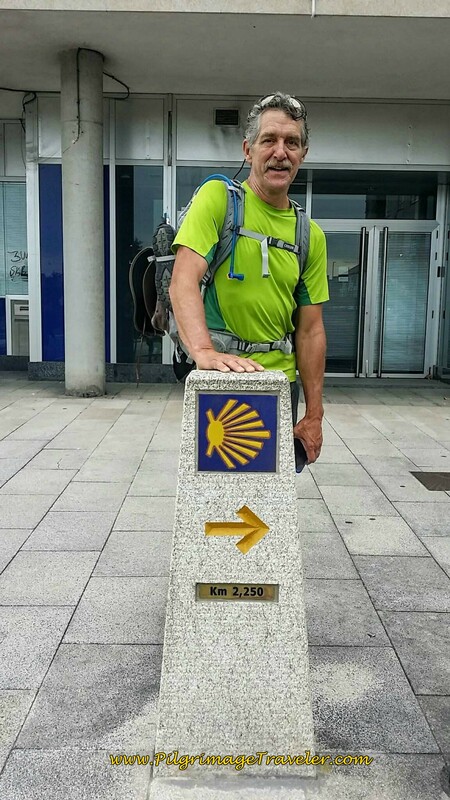 Rich at the 2.25 Kilometer Waymark! 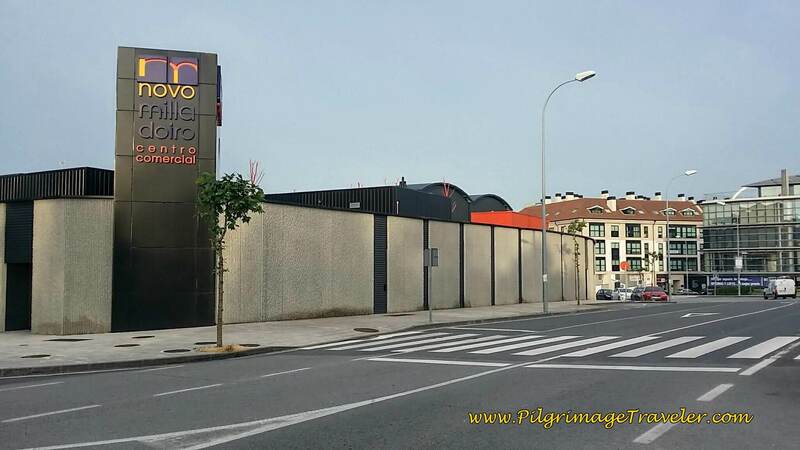 Walk for 400 meters to the next roundabout.Walk straight on to the Rúa de García Prieto. This is the part of the city where it feels like you are never going to get there! In 400 meters, merge with the Av. de Vilagarcía by staying left. Walk another 100 km on this street and come to an intersection at a broad avenue. Cross over the avenue, and directly across it find the narrow Av. de Vilagarcía as it continues in the same direction. Walk down 200 meters, coming to a small plaza. 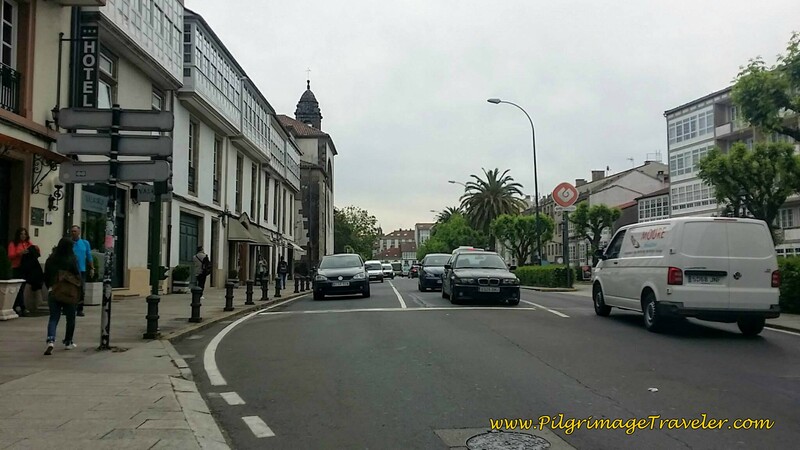 Walk across the Praza de Vigo and take the 2nd right onto the Avenida de Rosalía de Castro. 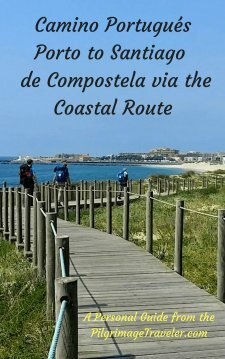 Here is where the Santa Marta route joins the Conxo route! Walk up the street on a long hill. ...staying left until the park ends, and you see a plaza with lots of café tables on the opposite street (in fair weather). Crossover here at the traffic light and head toward this plaza. As you walk across the Plaza you are now entering through the traditional pilgrim gate into the city, the Porta Faxeira. Historically this was called the Porta de Falgueris. You will see the sign marking this gate to your right on the edge of a building at the other end of the plaza. This is where the original medieval walls once encompassed the city. 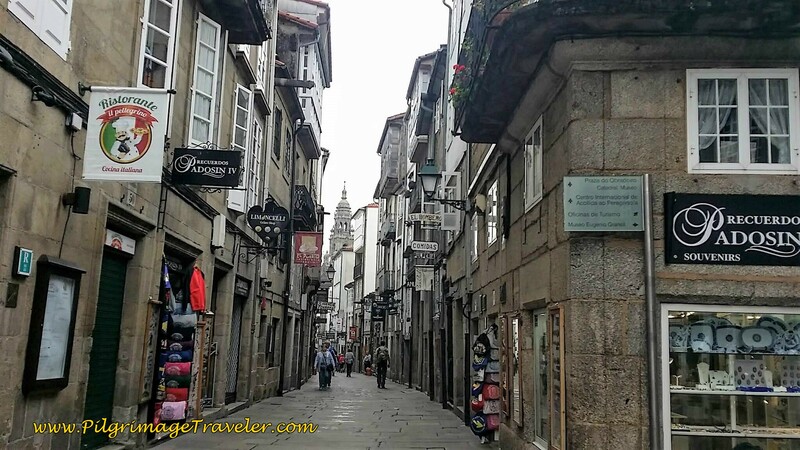 Welcome to the medieval center of Santiago de Compostela! You are mere steps from the cathedral. 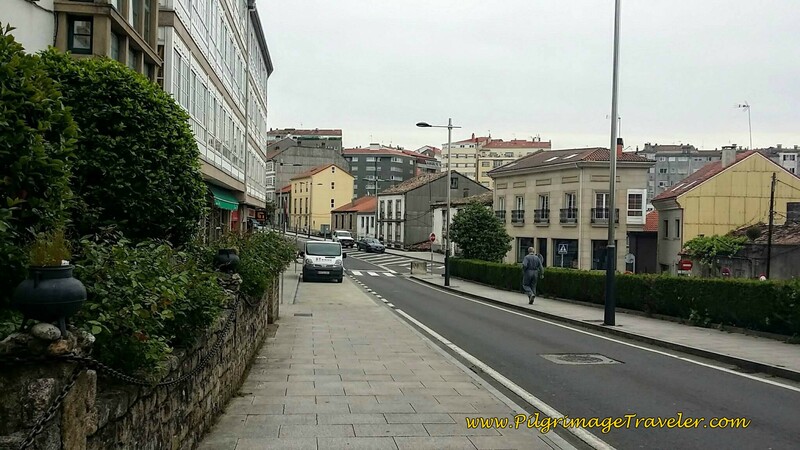 Walk through the Porta Faxiera, taking your second left onto the Rúa do Franco. 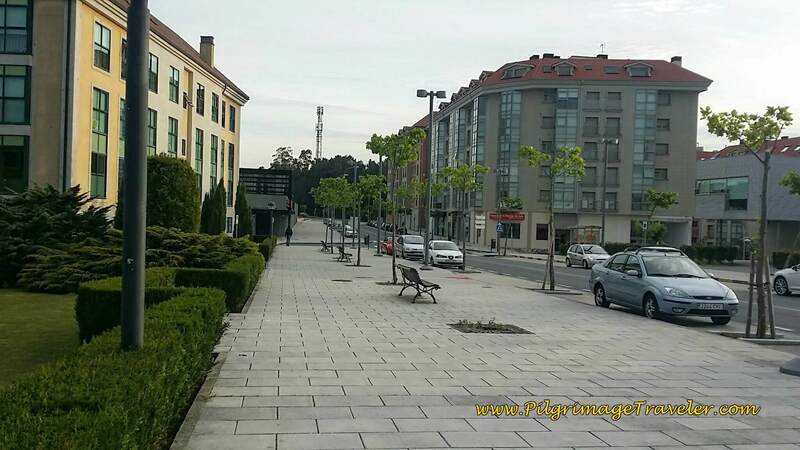 When you come to a small plaza in one-hundred meters, the Plaza Franco, stay left. Do you see what I see here? 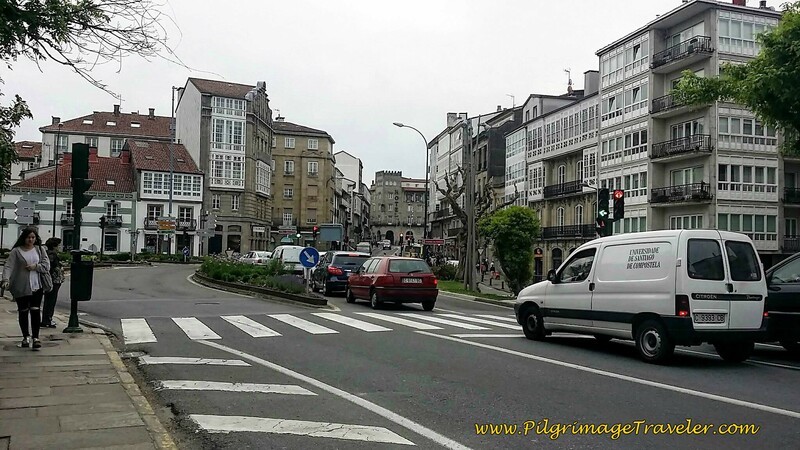 The sign says to Obradoiro Square! And yes, that is a cathedral spire ahead! Wow, here we are! Steve, our British friend had arrived the day before and was hanging out on the Square, with Lisa, our German friend. They were there to greet us and take the traditional photo. It was a joy to see them both, a great reunion day. You can see they have already obtained their Compostela, in the tubes. I was a bit disappointed to see the faux façade was gone from the cathedral, that had cheered up the scaffolding, previously. But it was a delight to see the top of both spires completed! More familiar faces arrived in the square a bit later, and we are hanging out in the square, having some fun! And then later, we ran into Hiro, from Japan! What a nice surprise. We hadn't seen him since the Coastal Route. And the icing on the cake was when we saw our long lost Aussie friends arrive! 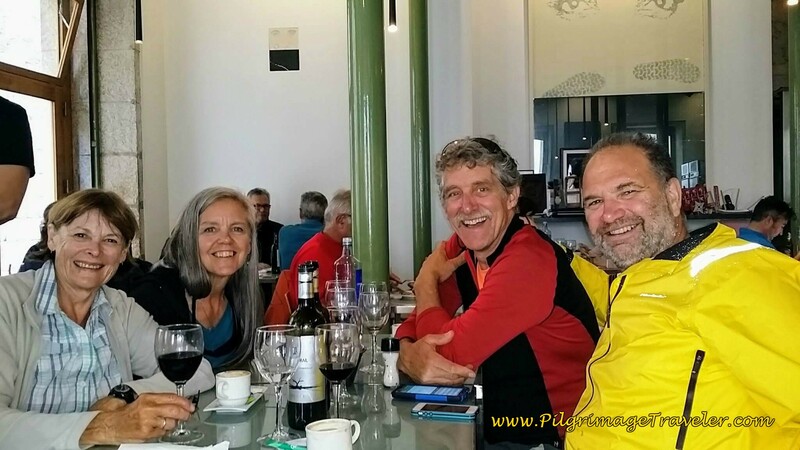 We look so happy, reconnecting over lunch at the Casa Manolo. 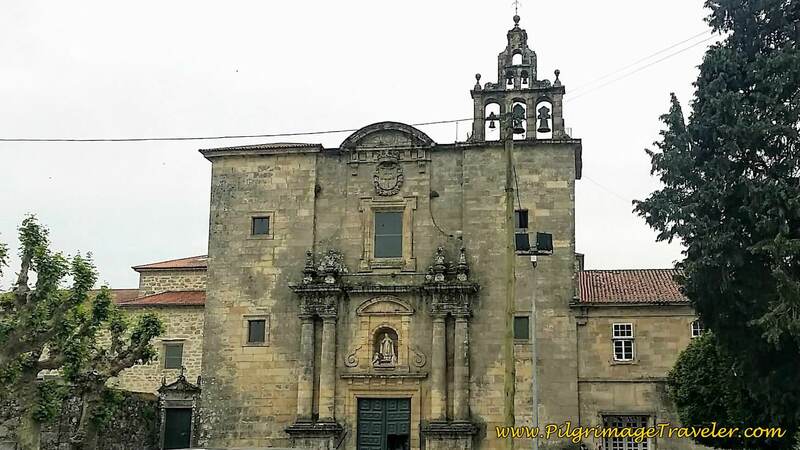 Later, the day after our arrival, when we had obtained our Compostelas in the pilgrim's office, both Rich and I got very teary watching the slide show in the chapel there, reminiscing over what the Camino had meant to us. I continued feeling strange and out of sorts. I didn't even want to be in Santiago. I wished we hadn't even stayed overnight there. I felt done with it. I wished we had just kept on walking to Fisterra or Muxia, or somewhere. Yet I didn't really want to walk! What a mixed bag of garbage I was feeling! We didn't have enough time to walk anyway. So we ended up hanging out a lot at Quintana square. I was trying hard to be present to the weird, weird feelings I was experiencing. 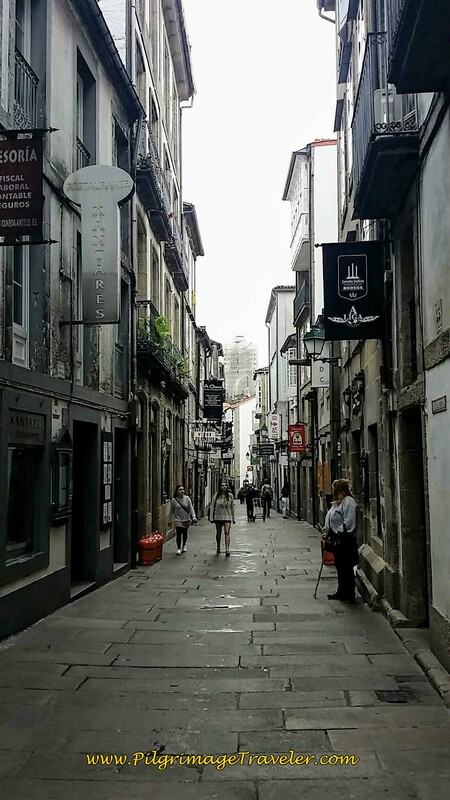 We ended up staying only one night in Santiago at the Casa Celsa-Barbantes, mere steps from the Cathedral on the Rúa de Franco. It was a bit more pricey than some, but the town was pretty full when I booked this one. We ended up busing to Muxía for one night, spending one day in this most special place, then returning to Santiago for another night before flying out. 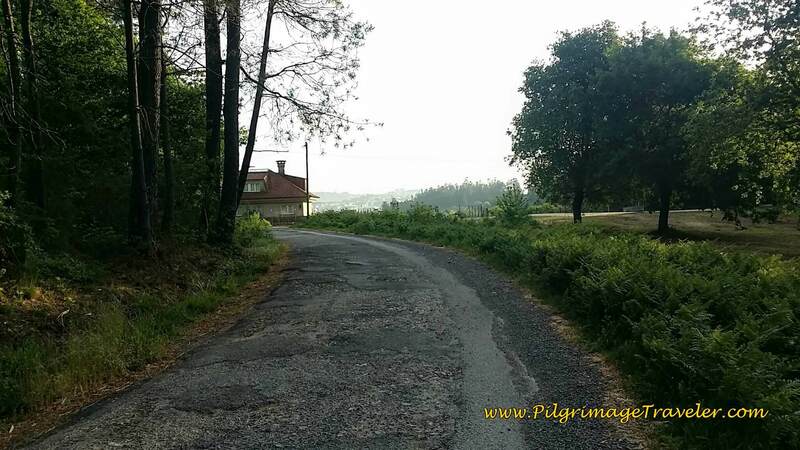 This time we stayed in the much more economical Pension Pazo de Agra, still in a decent location close to the cathedral, and very adequate in its amenities. I have also stayed in the Hospedería San Martín Pinario right on the Praza da Inmaculada, twice and it is also a marvelous place to stay. You MUST call for the pilgrim's rate if you plan to book ahead. It is in an old seminary building and they have individual, converted monastic cells that are private, and also regular-sized rooms. And so the journey ends. And so the pilgrimage begins. To return to the real-life world was a scary proposition for me, and most likely for Rich as well. Our lives had changed in order to be available for his mother and her new life full of needs. How long would a 90-year-old require our services? Who knew! Once again in my life, there were more questions than answers. 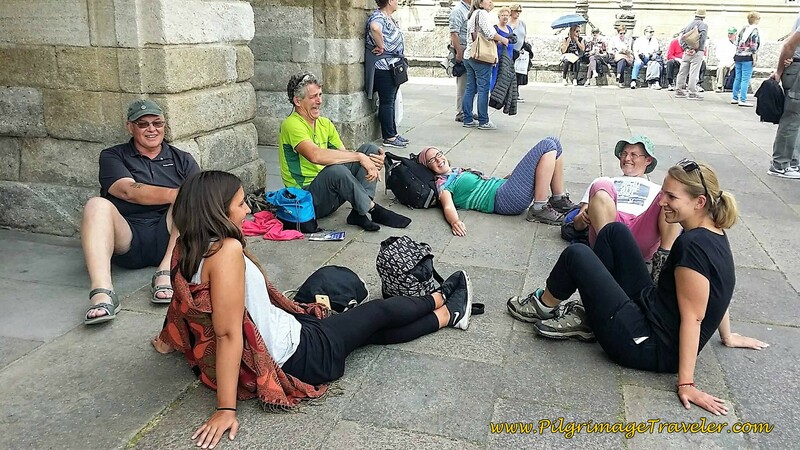 Leaving the Camino Portugués meant that the next phase of the journey had only begun. I hoped I was up for the challenge. 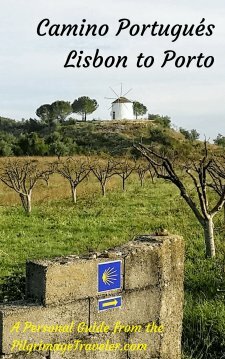 May your last day, and all your twenty-five days or so, on the Camino Portugués be only a precursor to your life's pilgrimage. 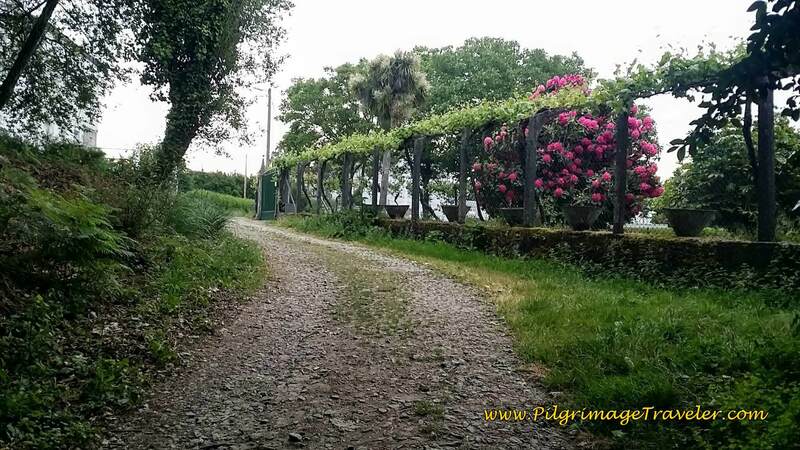 May your own Camino begin, when the walking ends.